For all of GamesBeat's E3 2015 coverage, click here. It’s tempting to assume that a video of a bunch of grown men crying over Final Fantasy VII is representative of the wider audience — but the data suggests that isn’t necessarily the case. Two separate entities, Amazon from the retailer side (via MCVUK) and Synthesio from the marketing side, reported that Microsoft’s Xbox One and its exclusive games were the most preordered and among the most talked about coming out of the event in Los Angeles. Amazon’s U.K. site sent out a press release that noted Xbox One’s Forza Motorsport 6 and Rare Replay were the “big winners” in that country. The company notes that Forza saw the biggest increase in preorders for a previously announced games. Rare Replay racked up the most preorders for a game that only just got announced during E3. Microsoft did very well with Rare Replay coming in at No. 1. Of course, this is Amazon U.K., and Rare is a U.K. developer. It’s likely that the Rare Replay collection is getting some home-country love. But even if you remove that from the list, Gears of War: Ultimate Edition is also right at the top and ahead of anything from the other publishers. We’ve asked Amazon for global and North American data to see how that compares, and it’s possible that games from Sony and Bethesda could dominate those charts. We’ll let you know as soon as we get it. But it’s interesting that in the U.K., a region that the Xbox has not always thrived in, is so hot on Microsoft products. But it’s not just sales where the Xbox One and its games are doing well. Marketing intelligence firm Synthesio also sent out a press release that claims Xbox One was the top console in terms of mind-share on social media. Most of that conversation was about the show itself, but the systems took second place with 20 percent of all discussions. “Specifically, Xbox drove the most buzz with 74 percent of all online mentions about video game systems,” said Pope. 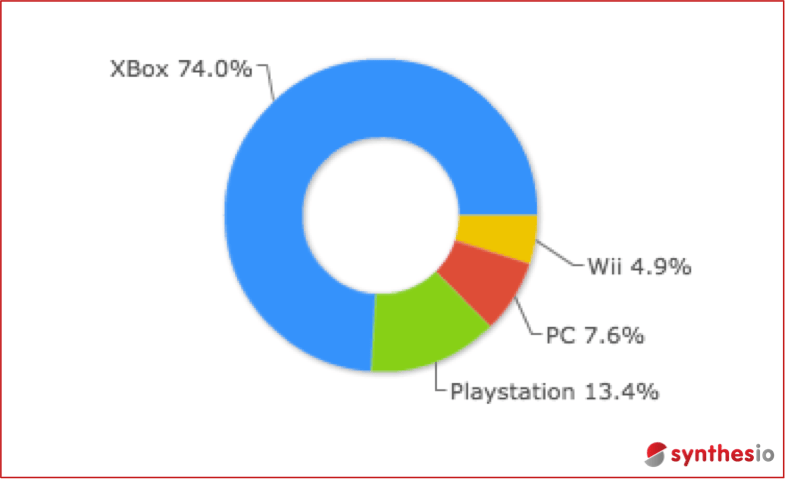 Synthesio explained that most of its data comes from Twitter, where 81.4 percent of all the E3 conversations took place. Instagram and Facebook only accounted for 3.3 percent and less than one percent, respectively. Overall, the intelligence firm claims that people were positive about E3 2015. Only 6.9 percent of all mentions were negative while 13 percent had a positive slant.